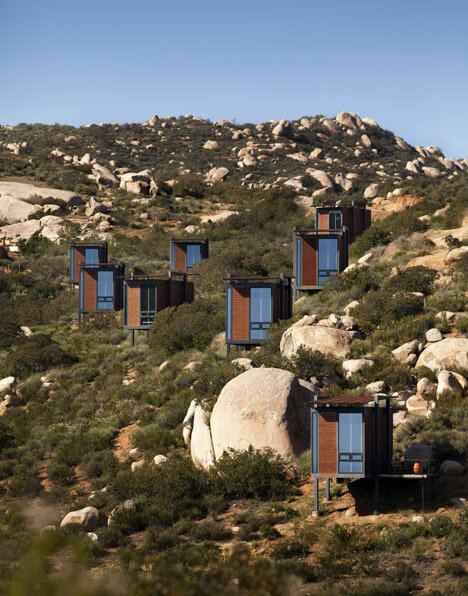 Hotel Endemico Resguardo Silvestre lies staggered between boulders among the Baja Wine Region in Guadalupe Valley. Much like the wine, the region itself seems to be getting better with time. Instead of rooms, this environmentally conscious design opted for nano cabins that blend seamlessly with the surrounding nature. Each loft-sized structure sits lifted off the ground on steel frames, as to make as little impact as possible on the earth below. The 20 room development is spread over 99 hectares and includes a winery, restaurant as well as residential area. The approach of design was to cover guests needs in luxury, while still maintaining a close connection to nature and the environment. Each cabin is a one bedroom ensuite that opens to a wooden patio over-looking the valley.